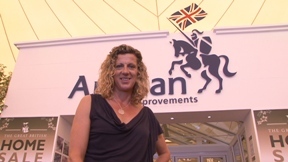 Anglian Home Improvements are lucky enough to have Olympic heroine, Sally Gunnell sending us regular updates. Here Sally talks about carrying the Olympic Torch through Bognor Regis and supporting other young Olympic talent hoping to make the team. I’m sure you’ll all have seen the hype around the Olympic Torch. There’s a kerfuffle around corporate torch-bearing places at the moment, but you know what? The people I’ve seen on the TV are totally inspirational and I’ve loved watching them take their turn. And of course, it’s getting me well in the mood for my own opportunity. I’ll be carrying the flame through Bognor Regis on 16 July. Bognor gets a rough press sometimes, so I’m glad the town will get the chance for some good news as the Torch comes through. The Jubliee weekend reminded me that nobody does big “public pomp” celebrations like us Brits. Watching the fly-past above Buckingham Palace was a high point for me. Just imagine what it’ll be like when the Olympics start; it’s going to be fantastic. Talking of the Olympics, you might have seen that Jess Ennis has set a new British Heptathlon points record. I’m so pleased for her, mainly because having watched her performances; I can see there’s more to come. Now there’s a frightening prospect for the rest of the field. In fact, our boys and girls are setting qualifying times left, right and centre at the moment. We’re going to have fierce competition at the Olympic Trials in a few weeks’ time. That’s a good place to be; we need the top guys to be pushed hard by the young guns. One up-and-coming star is my fellow blogging athlete Charlie Grice, who is sponsored by Anglian, as you know. He’s off for the World Junior Championship Trials shortly and is in great shape. My hubby Jon has been coaching him for some years now. He’s just beginning to realize his massive potential and both Jon and I are feeling pretty excited by his prospects. Every time he steps up a level, he shows the mental strength required to deal with it. The great thing about him is his willingness to “race”. It sounds weird, but running fast and racing aren’t the same thing; it’s the masters of racing who so often win big events. We still don’t know just how far Charlie can go, but I’d keep an eye on him if I were you. Catch you next month – July – which is….OLYMPIC MONTH!